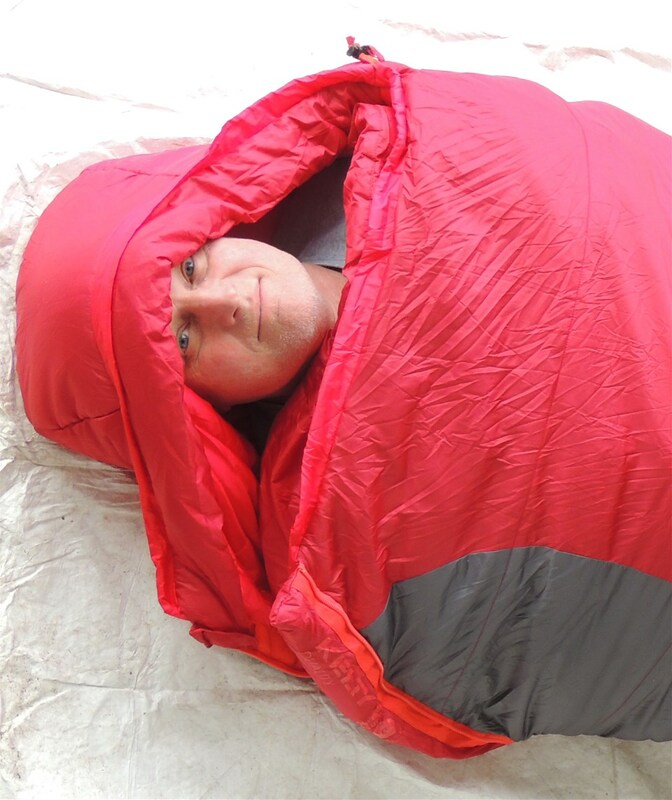 NEMO offers a variety of sleeping bags that feature “a shape for every style of sleeper.” Their Spoon™ Shape bag is an alternative in the backpacking class of sleeping bags, which are usually mummy-shaped. 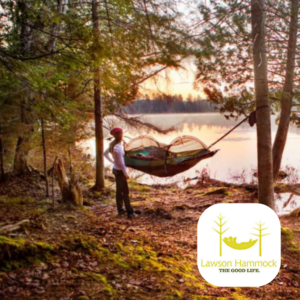 The Spoon™ Shape bags are likely to appeal to claustrophobes, restless kickers, or people who just plain want a little more room to curl up in their sleeping bag. 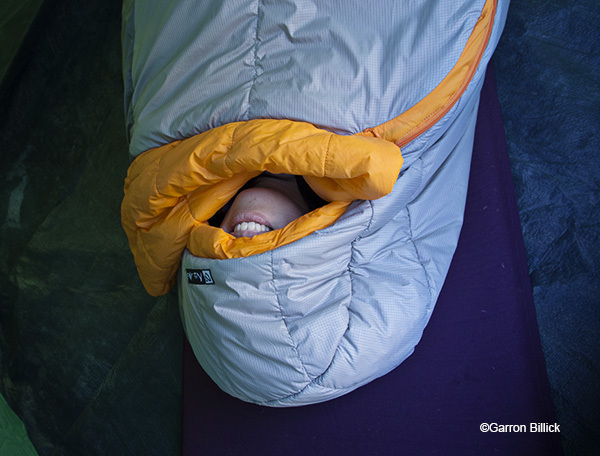 For this review, I paired the NEMO Harmony 40° bag with a 1.75″ thick sleeping pad and a 2-person tent in temperatures far below its suggested temperature rating. The NEMO Harmony is under a standard mummy bag, which highlights the shape difference and extra roominess of the Harmony sleeping bag. The bag feels lovely, very silky and light, and nice against your skin. There is no velcro either to scratch your skin (my pet peeve). There is not a lot of loft, which is on par for a 40-degree bag. I dripped water onto the bag to make sure the water repellent worked, which it did. I also threw the bag into the washing machine after camping in it. A “delicate” wash in warm water (per instructions) seemed to cause no harm and the medium spin cycle followed by air drying over night got all the water out of the fill. 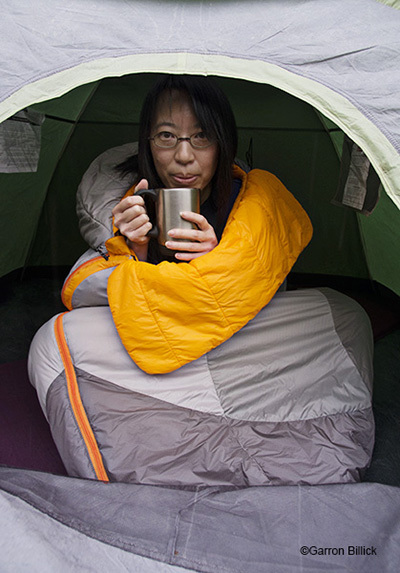 Since I am 5’3″ short, I put my 5’6″ tall boss into the sleeping bag and she verified that it most definitely fit, very comfortably. However, my 5’7″ co-worker said at least another 4 inches of length would be preferred. 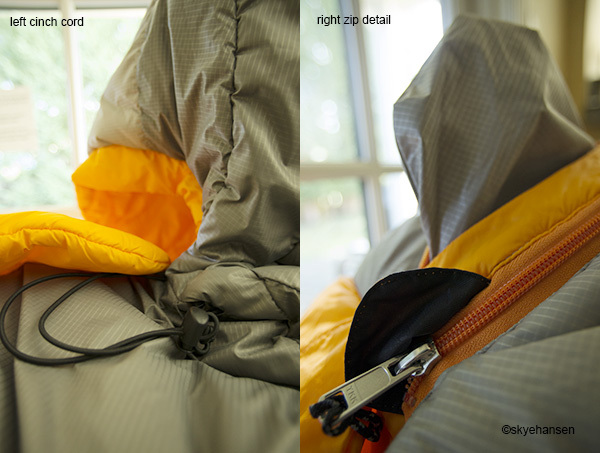 The hood can be easily pulled over your head without a pillow in the sleeping bag (with the extended baffle, you can really burrow down into this bag). However, the thicker a pillow you have, the more this hood is inclined to press against your head. This bag is great for minimalists who make do with flat pillows or a sweater wadded under their heads. I also noticed that it is difficult to reach out and cinch the elastic tighter around the opening of the bag. I eventually gave up, opting to tighten it before zipping myself back into the bag. The listed “packed size” of 14.5×9 inches probably refers to using the included stuff sack. Using a regular compression sack that has four cinch straps, I’m able to get the sleeping bag to occupy a much smaller volume of 9″x7″. In the Pacific Northwest area, we are currently enjoying a mild winter (depending on who you talk to). However, with the 40 degree rating, this is strictly a low elevation summer bag. When I encountered temperatures below the rating I had to put on a lot of extra layers to stay warm. This is a beautifully made bag and would be very well suited for a nice warm night. We have a few of those here in Washington, but really not enough to make this bag your one-and-only. For the same price you could get a much warmer bag and maybe even have change left over. 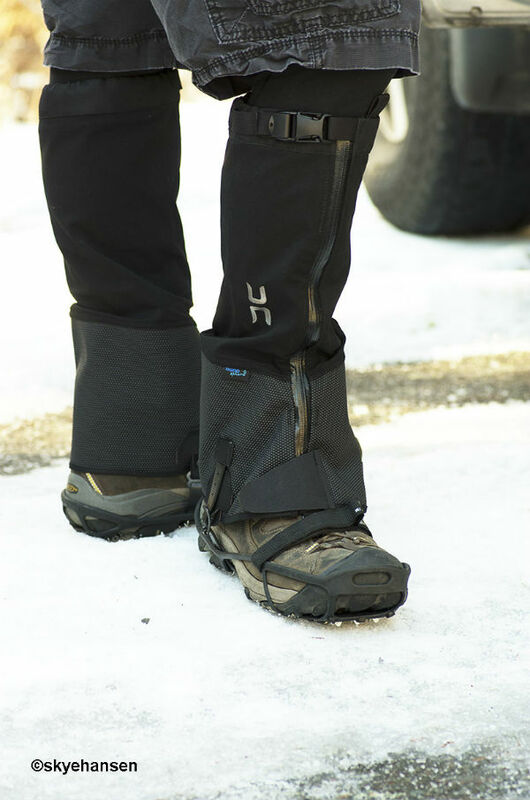 The leg room is great but the added room means that you have to heat up more air to stay warm. Listed Weight: 2 lbs. 1 oz. Included Accessories: Cotton storage bag, compression stuff sack.